I grew up in a household with hundreds of vinyl albums. My dad started his collection when he was young and the collection grew when my grandma moved in with us. The stacks grew from jazz like Herbie Hancock and The Crusaders to classic rock like The Eagles and Supertramp. Music is an important part of my life, as it is to most people with a pulse. It is particularly celebrated as the temperatures rise throughout the summer months with outdoor music festivals like Tomorrowland and Lollapalooza plowing through the U.S. and across the globe. With music’s prevalence in our everyday lives, it’s no surprise that we talk all things music and how it relates to your wedding this #WeddingWednesday. We believe that music is the icing on the cake for a wedding. Smooth tunes and the right musical decisions throughout your event can have a lasting impact on the overall wedding experience. First things first, couples should start by envisioning the vibe and style they would like for their wedding. Think of the total setting of your day including venue or venues and any transitions throughout: Is your style rustic, traditional, boho or swanky and upbeat? The way music is presented, whether it be by a live musician, band or DJ will enhance the overall ambiance. After your musical style is carefully chosen, consider variety within your music platforms. For example, do you want to transition the harpist during your ceremony to a jazz trio for cocktail hour? Then possibly turn it up on the dancefloor with a DJ during your reception? Regardless of transitions, interviewing potential music vendors is crucial to making the right decision. Go on their website, listen to samples and be sure to check out their event calendar to visit a local gig. The musical composition of your vendors will also help guide what kind of songs to include in your line-up. Do you want the 9-piece band with a male vocalist to cover even the female oriented songs? Or do you want to spend the extra money for a 10-piece band that has both male and female vocalists so you are completely covered? Last, but certainly not least, what is your music budget? Live bands are typically more expensive than DJs. You can typically find solo musicians (for ceremony and cocktail hour) for a reasonable price. Brides magazine provides an excellent pro and con list on making these selections. MAE’s Tip: Size matters. How much space is necessary for your band or DJ to perform? Ask your wedding planner or venue contact for venue dimensions, recommendations on how to best utilize the space along with room configurations that have worked best in the past. You will be surprised how much space is left after all of your guests, tables, chairs, dance floor and design elements are incorporated into the room. Prelude: Ambient music is played for 15-30 minutes while guests are being seated until the ceremony begins. A soft piano melody or a string duo is the perfect background during this time. Ceremony: Couples can select more songs to play throughout the ceremony or during special moments. Some religious denominations have pre-selected songs or hymns for their traditional wedding ceremonies held inside of a church or temple. Consult with your religious officiant for suggestions. Recession: Congrats! You and your spouse are officially one! The music here should be celebratory and lively as you walk down the aisle! MAE’s Tip: Couples who wish to express the meaning behind religious symbolism should consider having a dedicated speaker and/or emcee during the ceremony. This person can help narrate the important moments which will be better understood and appreciated by all of your wedding guests. This is especially key in the case of multicultural unions. Your cocktail hour is the perfect harmony of mellow and relaxed vibes. Song selections should increasingly progress in beat but not have guests break into the Nae Nae. Our personal favorite is Frank Sinatra for some classic tunes that every generation can appreciate, but it’s also important to select a playlist that is meaningful to you as well. Robert J. Nipcon, a Chicago DJ, created 10 different playlists ranging from Great Gatsby to Bahama Breeze to help couples find the perfect tunes for this transition. MAE’s Tip: Think of cocktail hour as the plateau of your music landscape. You still want to build on the excitement that will evitably ensue at your reception. Most guests will be completely consumed chatting away, catching up and enjoying your fabulous hors d’oeuvres. Entrance: This is where you make your grandest entrance as a couple for the first time in front of your loved ones. Your nearest and dearest typically catch some love here too: Important family members such as parents and the wedding party will be announced into the reception venue to an upbeat song to get all of your guests amped for the main celebratory component of your day. The newlyweds are announced with guests cheering and clapping. Select an introductory song that the two of you love that showcases your fun side and excitement for the grand finale! First Dance: You and your spouse’s favorite song plays during this moment. Spend time finding a meaningful song that connects both of you together that captures your love story. Do you want your song to be contemporary or a timeless number that will resonate across generations. Parent Dances: After the first dance, the father will take his daughter for a spin on the dance floor. The song here can be personal and usually is about how the dad sees his daughter all grown up. Their dance will transition into the mother and son dance. Pick a song that is sweet and don’t hesitate to ask your parents for some input to make them feel extra special and involved. Reception Reminders: Before handing the night over to your music provider, be sure to give a list of do-not-play and must-play songs. Have a mix of today’s hits and oldies so that your guests are not only listening to one genre. Team MAE highly encourages you to include group dancing with songs like the Casper Slide or the Cupid Shuffle to get those wall flowers out of their seats! Whatever you do, do not forget to select the Last Dance song!!! What kind of note do you want to end the night on? MAE’s Tip: Want more than just a simple dance? Surprise your guests and grab your wedding party to incorporate a cute group dance into your wedding events! We are loving this new Bollywood number "Baby Ko Bass Pasand Hai" and have a feeling this will be a new favorite at upcoming weddings! 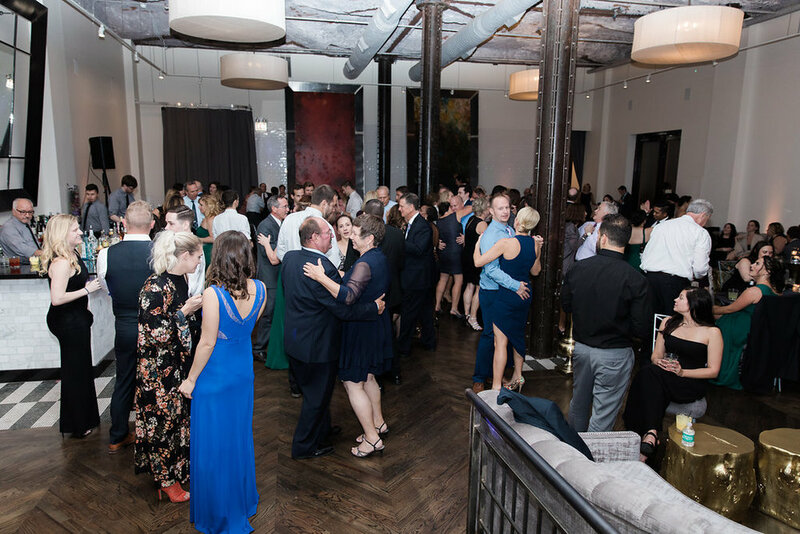 To see how Marquette Avenue Events can help you find the best music equation for your wedding or special event, please visit us at www.marquetteavenueevents.com or call us at 312-585-7265.